Crochet Supplies for Beginners: A Guide to Crochet Hooks - love. life. yarn. When starting to crochet you really don’t need many things to get going. I started with a loaned hook and one skein of yarn. It took me quite a few tries to get the hang of crochet, so don’t get discouraged, especially if you are a knitter first. For whatever reason I could not see the stitches when I started. I remember thinking “what stitches? I don’t see anything that looks like V’s!” I had knitted for about four years before it finally clicked for me. I think I had someone show me at least two times before that, but since I couldn’t see the stitches my projects turned into triangles or were uneven and I gave up. In knitting it is easy to see how many stitches you are working with just by counting the stitches on your needles. With crochet you have to know what you are looking at, especially on the ends. 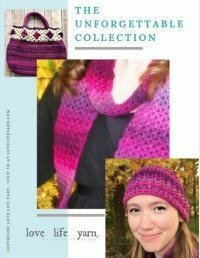 In the weeks to come I hope to publish more information for beginners as well as patterns for more seasoned crocheters. To start you really need two things: a hook and some yarn. I would recommend starting off with worsted weight or bulky yarn until you get the hang of it, then you can move on to whatever weight yarn your project requires. The size hook you will need depends upon the yarn you are using. Check the ball band to see what size is recommended. Most yarns will have a suggested hook size. The Craft Yarn Council recommends I (5.5mm), J (6.0mm), or K (6.5mm) for worsted weight yarn and you can choose one of those if you can’t find a suggestion on the ball band. For a good beginner project, such as a scarf, the suggested hook would work fine. The material of the hook makes a big difference in how it works with the yarn, and in my experience you really have to work with several to find what works best for you. I use all types of crochet hooks but definitely have a favorite, which I talked about here. Crochet hooks are made from plastic, metal (aluminum or steel), bamboo, wood, and sometimes glass, although you don’t find glass ones very often. In the stores you mostly will see plastic, metal, and bamboo. I love bamboo knitting needles and sometimes will use a bamboo hook but it really depends on the yarn. A yarn should slide easily off the hook but not so easily it falls off when you aren’t expecting it. Click on any of these pictures to find out more information. Steel crochet hooks are made for very fine crochet thread and are often used to make lace items like doilies. If you are truly a beginner, I would wait to use crochet thread until you have a few simple projects under your belt as it is harder to see the stitches on such a small scale. Plastic crochet hooks are inexpensive and come in all the common sizes. They are lightweight and comfortable, plus they tend to work well with almost any yarn. Yarns don’t tend to slide off too easily but glide nicely off with each stitch. Plastic is my choice for larger yarns and I reach for them whenever I need to use anything larger than a J hook. It has sizes L-P and is great for larger yarns. I love how well they work with most bulky and super bulky yarns. For some reason I misplace my larger hooks more often, so I like to keep extras around. For quite a bit less than $10 they are a good deal, too. These are sizes F-K and will cover you for DK and worsted weight yarns. These are some of the extra hooks I have for when I misplace my favorites, which happens sometimes when I have several projects going on. Very easy on the wallet, too! Aluminum hooks are also a great choice for beginners and you can usually pick up a single hook at Wal Mart for around $2. These were the hooks I used when I first began just because they were so abundant and cheap and I still have quite a few in my collection and use them sometimes. The yarn glides nicely and they work well for most fibers. Bamboo is a great material for working with yarn. If you have a more slippery yarn that tends to slide off of plastic or aluminum, try a bamboo hook. They tend to have more “grip” and keep the yarns from sliding. Sometimes, though, that can work against you if your yarn holds onto the bamboo and won’t slide off easily enough. Overall, though, I do love bamboo as the material tends to warm in your hand and is comfortable. Most of the hooks you will find when you search for “wood crochet hooks” turn up results for bamboo hooks. There are a few nice ones made out of materials such as rosewood, but I haven’t used these. I have also never used glass crochet hooks and probably would not start there as a beginner. So there you have it – a guide to hooks for beginners. In the next post, we will cover some recommended yarns for beginners that work well with these hooks. Thanks! Very informative. Am new to this but do knit-which is why i am finding learning to crochet hard..ish. Keep trying Samantha! It really did just “click” for me one day after trying quite a few times, then it was so natural. 🙂 I still knit but find crochet so much faster and more relaxing. Thank you! Your instructions are very clear and easy to understand. I still have trouble with the edges staying straight. Having to take apart over and over again. Could you hep, please? Thanks so much for all the information! Another helpful post would be about the type of hook on crochet needles: the smooth tapered hook or the sharp inline hook. Is there a benefit or negative to either one? I’ve tried both I’m sure there is a reason for the difference in hooks.